THE expose that the Malaysian Rubber Board (MRB) was deprived of RM780 million from a land sale to the Employees Provident Fund (EPF) has put the spotlight on a company owned by the Ministry of Finance (MoF) called Aset Tanah Nasional Bhd (ATN). The MRB comes under the Primary Industries Ministry and in 2010, under instructions from the MoF, sold 2,800 acres of land in Sungai Buloh, Selangor, to Aset Tanah for RM1.5 billion. A year later, Aset Tanah sold the same piece of land to the EPF for RM 2.28 billion — a whopping 52% gain. The land is to be used by the EPF to develop Kwasa Damansara, a 3,285-acre mega township project launched by then prime minister Datuk Seri Najib Razak in 2010, with the EPF’s wholly owned Kwasa Land Sdn Bhd as the master developer. “Basically, the MRB was ordered to sell — no questions to be asked,” said Sankara Nair, the new MRB chairman. The MRB has sought the assistance of Auditor-General Tan Sri Madinah Mohamad to investigate and is mulling legal recourse to recover the money it feels should have gone to it. Although Aset Tanah is owned by the MoF, and the MRB and EPF are government statutory bodies, that transaction was not a simple case of the RM780 million going to the left pocket instead of the right pocket of the government. It is obvious that the MoF wanted Aset Tanah to pocket a gain of RM780 million instead of having the entire RM2.28 billion go to the MRB, which would only have been able to use the money for specific purposes, as allowed by the Act under which it was formed in 1996. The MRB was set up through the merger of three other rubber industry bodies to be the guardian of the industry and undertake programmes to ensure its modernisation and sustainability. This means whatever funds it has cannot be used for any other purposes. By using Aset Tanah as the middleman in the land transaction, it meant freeing RM780 million to be used by MoF for other purposes. What does Aset Tanah do? Incorporated in August 2007 as National Content Development Corp Bhd, it changed its name to Aset Tanah in March 2011. It states that it is in the business of real estate and provides managerial, corporate, technical, professional, financial and internal auditing services. For its financial year ended December 2016, the latest available, Aset Tanah had no revenue but registered an after-tax profit of RMRM9.83 million and accumulated profit of RM788.87 million. It had total assets of RM1.6 billion, up from RM793.11 million in 2015. Total liabilities as at end-December 2016 amounted to RM805.18 million, up substantially from RM18.85 million in FY2015. 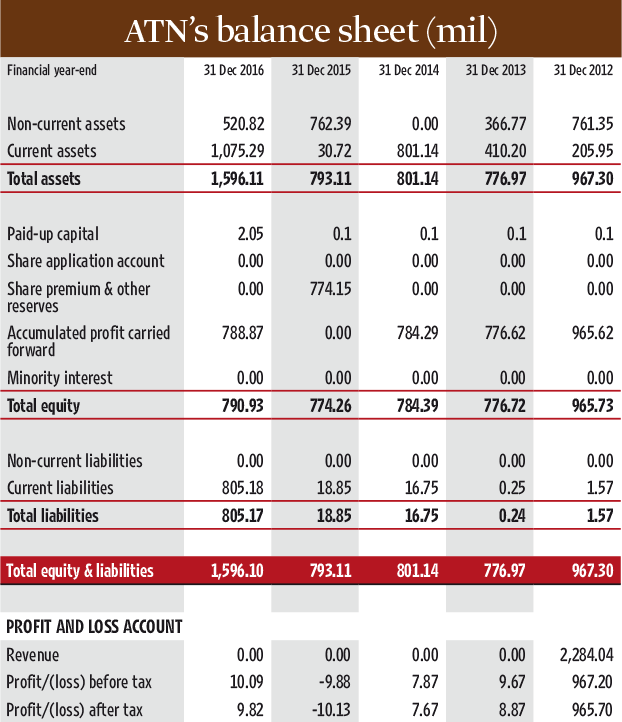 The financials by themselves do not tell much about what Aset Tanah does. But a deeper look into its dealings reveal that it was used by MoF to undertake land and development deals related to 1MDB, Tan Sri Syed Mokhtar Albukary (see sidebar) and Indonesian businessman Tan Sri Peter Sondakh. Indonesian developer Mulia International Ltd — a vehicle of Eka Tjandranegara — bought land in 2014 through Mulia Property Development Sdn Bhd for RM665 million in 1MDB-owned Tun Razak Exchange (TRX) to build the 492m tower called The Exchange 106. In July 2017,MoF quietly bought a 51% stake in Mulia Property Development through Aset Tanah, which did not buy it directly but used a company two levels away from it called MKD Signature Sdn Bhd, wholly owned by a subsidiary called Sentuhan Budiman Sdn Bhd. It appears that it was done this way to disguise the fact that MoF had invested into a project that was supposed to have been developed solely by Mulia. It is believed that MoF had to step in via Aset Tanah/MKD Signature because Mulia was unable to get bank financing after media exposes, including those by The Edge, on the 1MDB scandal. According to Suruhanjaya Syarikat Malaysia (SSM) info, MKD Signature has a charge of RM2.0 billion from The Hongkong and Shanghai Banking Corp Ltd, taken in September 2017, two months after it bought into Mulia Property Development. Last June, new Finance Minister Lim Guan Eng revealed that Mulia group must repay the government the sum that MoF had invested in TRX as capital. It appears that the so-called 51% equity investment done in 2017 was not a straightforward one, and was in reality, a bridging loan from MoF to Mulia because the Indonesian company was unable to obtain bank borrowings directly. Apart from having to deal with Mulia, the new government has also announced that it has to pump in RM2.8 billion to make sure the TRX development is completed, as abandoning the project means it would have to pay RM3.51 billion in compensation to investors. Among these are HSBC, which is building an office tower, and Australia’s Land Lease, which is developing a large retail component there. 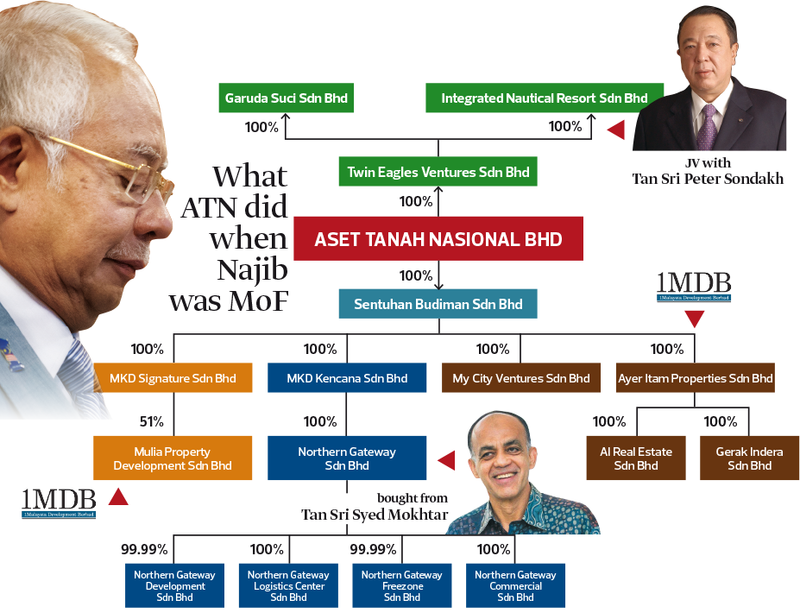 Aset Tanah via Sentuhan Budiman also owns Ayer Itam Properties Sdn Bhd, formerly known as 1MDB RE (Ayer Itam) Sdn Bhd. 1MDB RE had acquired 234 acres of land in Ayer Itam, Penang for RM1.38 billion in 2013 shortly before the 13th general election. The acquisition was riddled with issues. In 2013, Ayer Itam Properties forked out RM338 million for Farlim Properties Sdn Bhd and RM930 million for Gerak Indera Sdn Bhd — the two companies that owned the 234 acres. 1MDB also acquired several plots of land in Penang for RM113 million from Farlim Group (M) Bhd, including about 20 shops and terraced houses, located around Air Itam town. The 234 acres were subsequently transferred to another Aset Tanah subsidiary, called My City Ventures Sdn Bhd, which was previously under 1MDB as well. The finance minister had told Parliament last July that on Aug 24, 2017, the Ayer Itam land was sold to Cayman Islands-based Silk Road Southeast Asia Real Estate Ltd, for RM2.7 billion, thus netting a profit of RM1.32 billion based on the original RM1.38 billion purchase price. The sale was done by the previous government by selling My City Ventures to Silk Road. What was intriguing is that while money was received, Lim said the shares in My City Ventures were never transferred to Silk Road. This raises the question as to why the shares were not transferred and who owns Silk Road. Sources say the transaction could be just a case of round tripping, that is, the buyer and seller are the same people. In this case, the RM2.7 billion actually originated from MoF and was used to buy My City to give the impression that it was a genuine transaction, but the goal was to cover a hole caused by the problems at 1MDB, The Edge had previously reported that the RM2.7 billion may have been from another wholly-owned MoF unit — Suria Strategic Energy Resources Sdn Bhd. Suria Strategic was established to undertake the since-suspended RM9.4 billion gas pipeline project awarded to China Petroleum Pipeline Bureau on Nov 1, 2016. Of the total contract value of RM9.4 billion, RM8.3 billion, which is equivalent to 88% of the project value, was paid even though only 13% of work had been completed. The Edge and The Wall Street Journal, as well as Sarawak Report, had reported that projects awarded to Chinese companies such as the gas pipeline and the East Coast Railway Line by the previous government were inflated to siphon money that was to be used to cover the losses incurred by 1MDB. A wholly-owned unit of Aset Tanah, Twin Eagles Ventures Sdn Bhd, has 30% stakes in two companies — Garuda Suci Sdn Bhd and Integrated Nautical Resort Sdn Bhd. Garuda Suci is involved in the development and management of the Langkawi International Convention Centre while Integrated Nautical developed and owns the St Regis Hotel on the island. Garuda and Integrated Nautical had the same partners for both ventures. The Langkawi Development Authority had a 30% stake in both while Indonesian tycoon Sondakh has a 40% stake. According to SSM filings, Integrated Nautical Resort had a RM246.54 million unsatisfied credit facility with MoF-owned Bank Pembangunan Malaysia Bhd and an unsatisfied RM20 million facility with the government of Malaysia. Garuda Suci, meanwhile, had a RM57.75 million credit facility with Bank Pembangunan, which was unsatisfied, and a RM15 million facility with the government, also unsatisfied. Both companies have been bleeding red ink since 2013. Questions have been raised as to why Bank Pembangunan provided a big loan to a company where an Indonesian businessman had a 40% stake and was the single largest shareholder. It is also worth noting that Sondakh wholly owns the Westin Langkawi Resort and Spa, located not far from St Regis and which is in direct competition with it. Executives of construction companies say the cost of building the St Regis in Langkawi is among the highest for a hotel in Malaysia on a per room basis. The construction was said to be undertaken by Sondakh. The bank’s credit committee had also noted that “the proposed convention centre is unlikely to be sustainable” after the Langkawi Asean Summit 2015. The assets parked under Aset Tanah appear to be troubled entities that will require more money to be poured into them to have a chance for them to turn around. But will it be a case of good money chasing after bad?